Strawberries are probably the best-known and most commonly found sweet berry in the world. What more can be said? Nowadays, common strawberries are of two kinds: June-bearing (or "single-cropping") and "daylength-neutral"; there used to be—and one can still find for sale samples of—a type called "everbearing," but those are not terribly satisfactory (but, just to confuse you, daylength-neutral types are too often wrongly referred to in catalogues as "everbearing" because they do crop throughout the season). June-bearing cultivars are what is called “short-day”, because—rather like onions—they are sensitive to the length of the day (well, technically of the night). They only set flower buds when the days become shorter, typically in late August and September; then, the following May, blossoms appear, with ripe fruit following in, yes, June. Cultivar selection for this type in northern climes is especially critical, because many California-developed June-bearing strawberry cultivars are not good choices for the north: the plants tend to be short-lived, not very productive, and of poor fruit quality. Daylength-neutral cultivars, on the other hand, are just what their name says. Flowering and fruiting occur together, from June through October (till frost, that is), though production often sags during the hotter days of the season (typically late July and August). It seems commonly felt that the fruit of most daylength-neutral berries generally lack the size and full flavor of those from June-bearing plants, though that is painting with a very broad brush. The choice no longer needs to be based on the production period of a given type: with the modern freezer available, the fruit of either kind can be preserved for great lengths of time. The decision becomes more a matter of personal convenience: do you want to harvest your crop in a short time window and freeze most of it, or do you prefer a daily small-ish serving of fresh berries? And there is flavor (though both types have fine exemplars) and total productivity (though for the home grower, even that is not a big deal, as another plant or three takes very litle extra garden space). In either case, make absolutely, positively sure that you buy stock that is certified disease-free, preferably from a specialist vendor. And when you go to plant, be ruthless in discarding any crowns with damaged roots. "The ordinary wild wood strawberry of Europe, the fraise des bois or vesca, is rarely tasted today except by epicures." There are other solutions to the fresh availability problem. Besides the common or garden strawberry (Fragaria ananassa) described above, there are a few other much-less-known (in the U.S.) types: Alpine strawberries (F. vesca), musk strawberries (F. moschata, especially popular in Italy), pineapple strawberries (F. grandiflora), Virginia strawberries (F. virginiana), and probably more (how many depends on whose botany one wants to go by). Of that lot, it appears from the literature that the two chiefest classes of culinary interest are the so-called “Alpine strawberries” and the much-less-known (even in Europe, where the large and—they feel—underflavored American types are looked down on) "musk strawberries". Those types are not, and almost surely never will be, very popular here because they do not at all lend themselves to commercial production, that Holy Grail of U.S. crop evaluation. But for the home gardener especially interested in the finest available flavor, they have a definite attraction. Owing to their noncommercial character, there is dismayingly little information beyond the basics available—in English, anyway—about either berry species. Size — the berries are small, significantly smaller than common strawberries. Productivity — they bear rather lightly per plant. Flavor — adjectives commonly tossed about are "excellent", "superb", and "intense". Growth — they are true perennials, and quite winter-hardy (typically to Zone 3). Fruit Set — they fruit continuously during the warmer months, and are thus true "everbearing" plants. Vigor — they grow easily, needing little attention, little water, and not even necessarily full sun. Appearance — the plants are so nice-looking that they are often used as decorative borders. The light bearing and small berry size are not critical to the home gardener, who can grow lots of plants, as they need not consume prime garden real estate. And, as a bonus, there are yellow varieties that are invariably reported as virtually bird-proof (apparently the birds think them immature, owing to the color) and so require no netting. Alpines are no longer rare, and can be gotten from several places as both plants and seeds (they can be grown from seed with fair ease, unlike standard strawberries), even in both red and yellow. Most Alpine-strawberry fanciers seem to feel that the yellow types are not just bird-safe, but are clearly the better-tasting sorts. A types reported as especially flavorsome is Yellow Wonder. Most Alpine types runner only feebly if at all, though occasional exceptions are reported; the plants are usually multiplied by division every year or two, though they grow readily from seed. (At least one gardener holds that to get their best flavor, one does not eat them out of hand, but proceeds thus: try putting a handful in a bowl, sprinkling them with sugar, crushing gently and leaving to macerate for as long as you can bear it. Within ten minutes the juice has burst out, apparently from nowhere, and you’ll have a mouthful of superb flavor, with a hint of sharpness that sets the taste-buds humming, not to mention an interest and depth that modern varieties really don’t possess.) Mind, not everyone agrees on the need for such treatment: most seem happy to pop them straight from plant to taste buds. To repeat, though: the fruits, and the plants, are small; plan on quite a number—perhaps a few dozen—to get a substantial harvest. Musk strawberries are definitely different from not only common strawberries, but from Alpines. Musk strawberries, possibly the most desireable of all (and certainly the most popular in Italy), are much harder to find in North America then Alpines, but they are out there. Musk strawberries, having evolved in cool, wooded areas, do not do well in warm climates. One gardener who grew them with success in New York State was unable to get any meaningful crop in Georgia, a condition confirmed by another Georgian. If you grow musk strawberries, be keenly aware of at least these three things. First, they are not at all self-fertile: you must have two different sorts (most sellers now offer a male musk strawberry, as the named types are typically female). Second, they must be picked only when fully ripe: they develop their famous flavor very late in the ripening process, and if picked too soon will surely disappoint (you should be able to tell by the aroma if they’re ready). And third, they are notoriously aggressive bordering on invasive: used as a ground cover, they even choke out weeds. The plants are not terribly expensive, but—as one would want quite a number—they can get add up unless you just buy a few and patiently wait for them to expand their coverage by sending out runners. The two most commonly available cultivars are Profumata di Tortona and Capron, both ancient and much-praised. Some say they will cross-pollinate, but both are listed as female types, so acquiring an expresly male plant to assure pollination is highly recommended. The notes below are just that: notes, not a complete description of strawberry culture. For fuller details and illustrations, we refer you to some appropriate links. Moreover, they apply chielfy to conventional American strawberries; for Alpine types, you grow from seed, and are best to follow the seedsman’s recommendations. All strawberry types prefer fertile, well-drained, moisture-retentive soil in a sunny position; they can tolerate semi-shade, but it will reduce productivity, except (perhaps) in the European types. Working a little peat moss well into the soil as you prepare the bed is usually thought wise. Mix in some balanced fertilizer, too, but don’t go crazy with it (say a rate of 1 pound per 100 square feet); work it several inches into the soil. Regardless of strawberry type (except if growing Alpines from seed), buy certified virus-free plants from a reputable orchardist, preferably in your climate area. Your chosen vendor will usually work with you on a delivery date, but expect that date to be "as soon as the ground can be worked in the spring"—usually in March or April—so as to let the plants become well established before heat sets in. How you lay out and space your plantings is to an extent a function of what type of strawberry you are planting—for common strawberries, see the link described in the next paragraph. Alpine and musk strawberries, however, can be planted in whatever pattern makes sense to you, since they are propagated by division, not runners (though some gardeners do report vigorous runners from such plants, contrary to general claims about them—if you get runners from such types, you are probably best off to prune them back). Do not plant your new strawberries if the soil is wet: wait a few days till it’s dry. Try to plant on a cloudy day, or at least in late afternoon, to avoid stressing your transplants. Set each strawberry plant so that soil is just covering the tops of the roots; do not cover the crown. There is an illustrative cross-section sketch on this page from the University of Illinois; that same page includes discussion of and photographs of the various methods of laying out plantings for June-bearing and daylength-neutral strawberries. Another all-round discussion of planting strawberries can be found at Growing Small Plants For the Home Garden: Strawberries from Washington State University. In the year you plant your strawberries, remove all flowers on June-bearing-type plants as soon as they appear; on day-neutral-type plants, remove all flowers till the end of June, then let new flowers remain to set fruit for a summer/fall harvest. Doing all this promotes sound root and runner development, establishing your plants for the following season. It is as well to mulch strawberries as soon as you get them planted (you have to before winter anyway); they are said to do especially well with a mulch of pine or spruce leaves, though they’ll probably want something thicker, say straw, in the fall for overwintering. Note that blossoms will be damaged by any unusually late spring frosts. After the first harvest (in the second season), strawberries should be fertilized; apply balanced fertilizer after you renovate the plants in July. (See the WSU site linked above for a full discussion of renovating a strawberry patch.) Don’t get carried away and over-fertlize, or you will get lots of green but small berries. Water the fertilizer well into the ground, to carry it down to the root zone. Common or garden strawberry plants, though nominally "perennial", tend to degenerate after three or so years, and need to be replaced; that is not so of the Alpine or musk types, though it is wise to keep those vigorous by dividing them every 1 to 3 years. 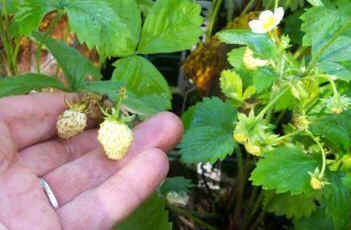 The Advantages of Alpine Strawberries - has lots of good, practical information and advice. Species of Strawberry Plants - a scientific analysis of the various species. The strawberry, genus Fragaria, is another delight from that cornucopia of goodness, the family Rosaceae; there are more than twenty named species, with many hybrids and cultivars. The strawberry is an "accessory" fruit: the fleshy part is derived not from the ovaries (which are the "seeds"—actually achenes—but from the peg at the bottom of the hypanthium that held the ovaries. From a technical standpoint, then, the seeds are the actual "fruit" of the plant, and the flesh of the strawberry is just modified receptacle tissue. That flesh is greenish-white as it develops and, in most species, turns red when ripe. The classification of strawberry species is based on their varying numbers of chromosomes. There are seven basic types of chromosomes that all species have in common, but they exhibit different polyploidy. Some species are diploid, having two sets of the seven chromosomes (14 chromosomes total); others are tetraploid (four sets, 28 chromosomes total), hexaploid (six sets, 42 chromosomes total), octoploid (eight sets, 56 chromosomes total), or decaploid (ten sets, 70 chromosomes total). As a rule of thumb—there certainly are exceptions—strawberry species with more chromosomes tend to be more robust, and to produce larger plants with larger berries. Strawberries have been known as a human food for well over two millennia, being known on the Italian peninsula at least as far back as 234 B.C. When the first Europeans landed in Virginia in 1588, they found strawberries growing there, too. 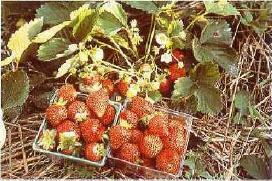 The emigrants in the Massachusetts colony were eating native-cultivated strawberries at least as early as 1643. Back in the Old World, Dr. William Butler (a 17th century writer) made the now-famous observation "Doubtless God could have made a better berry, but doubtless God never did." A very thorough history of the berry by the berry scholar G. M. Darrow is available on line. Strawberries have always loomed large in lore and legend (and alliteration). Madam Tallien—nicknamed "Our Lady of Thermidor"—prominent at the court of Napoleon, famously bathed in the juice of fresh strawberries, hoping thereby to preserve her skin tone and color; she used a mere 22 pounds a go. Fontenelle, a centenarian writer and gourmet of the 18th century, believed that his long life was due to the strawberries he ate. It was last modified on Tuesday, 12 February 2019, at 21:38 EST.